Moving your business and all the associated IT services, equipment and facilities to a new location is very stressful – as getting it right is critical. Get it wrong and you reduce productivity and cause long-term problems for your business. 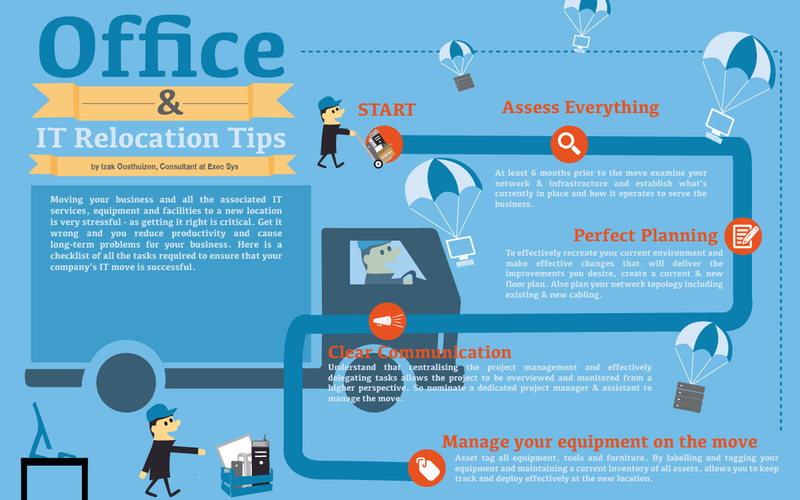 Here is a checklist of all the tasks required to ensure that your company’s IT relocation is successful. At least 6 months prior to the IT relocation, examine your network & infrastructure and establish what’s currently in place and how it operates to serve the business. This insight gives you a start point to help identify the best route to your new destination. It enables you to decide what to keep, upgrade, scrap and potentially move to the cloud – or a co-location facility. This may seem obvious, but our experience tells us otherwise, so before moving, ensure that the new location has installed and tested bandwidth. We have had to provide multiple, 4G dongles, to bridge a gap between relocation date and new bandwidth installation. It’s important to determine how much downtime your business can afford during the move, so you can pick the most appropriate relocation date. If there are bank holidays available, this can be a good moving period and extend the window for the relocation. To mitigate against the disruption to “business as usual,” ensure staff can access systems remotely on day 1 after the move — either from home or an alternative office space. Moving your valuable and expensive equipment comes with inherent risks, so it’s imperative that your equipment is covered by an appropriate insurance policy, in case of any accidents or mishaps. Check the policy is in date, the clauses are suitable and the value of cover is sufficient. Involvement of 3rd party vendors is necessary to ensure that equipment and services are effectively transferred between sites. Get references and see a documented and structured plan. Give your vendors plenty of notice and hold a project meeting and ongoing meetings at periodic intervals. This keeps everyone focused and on the same page. Every step will undoubtedly have some form of financial impact. With the right planning each step can be professionally managed to come in on budget — as no one wants any surprises. To effectively recreate your current environment and make effective changes that will deliver the desired improvements, create a current & new floor plan. Also plan your network topology including existing & new cabling. The layout of cabling is the core to effective power usage, data and voice transmission, so ensure that all new office areas have plenty – even excessive – data, telephone and power. This aids future proofing and any change of layout. Also, build in cooling and proper ventilation as a single implementation exercise – be bold as it will be more expensive if you under-estimate. Moving between buildings means the powering down of main circuitry, so planning is critical around backing up and protecting of data resources. Ensure this also involves external drives and cloud back-up. Re-locating is the perfect time to make changes, so old equipment can be recycled and new devices implemented to obtain maximum efficiency. New equipment will not only be quicker, it should also use less power and generate less heat. If you’re moving servers, consider co-locating them at a hosting facility, so you never have to move them again. When moving between sites, you may find it not necessary to retain all the third party vendors. Perhaps your new location comes with “serviced” components as standard. All factors need to be considered, but only cancel contracts you’re confident you have replaced – or can do without. Understand that centralising the project management and effectively delegating tasks allows the project to be overviewed and monitored from a higher perspective. So nominate a dedicated project manager & assistant to manage the IT relocation. Also, create an internal & external contact directory to ensure that everyone is contactable and that at any time you require a resource – it will be available. Try a cloud based project management tool like Smartsheet to enable anywhere collaboration. Arrange meetings for both internal & external IT relocation teams to keep everyone in touch and current with progress. This allows you to keep a watchful eye and ensure that all goes according to plan. It’s also imperative that all parties involved report all findings, concerns and updates. This will allow the project to move swiftly and enable you to dedicate resources where required, to ensure key tasks get completed – with the least amount of impact. Asset tag all equipment, tools and furniture. Labelling and tagging your equipment and maintaining a current inventory of all assets, allows you to keep track and deploy effectively at the new location. You can label & colour code according to departments. Different ways of grouping will allow you to more effectively manage all equipment. The nature of the packaging and the transport must befit the type and needs of the equipment being relocated. For example, some equipment, such as servers, should be bubble wrapped and transported in cooled vehicles. Also ensure your plan includes a documented checklist of tests and valid fall-backs, or a contingency plan. List every element that affects your ability to deliver service, including the outside world’s awareness of your change — this could be your new address on the website and potentially your IP address range. If it connects to something then test that it still does this, if you should access something, then test that you still can. Be thorough, diligent and above all – be pedantic and you won’t fail. So, plan your IT relocation in advance and share the plan online with collaborators, be meticulous, identify opportunities for positive change, think big and give yourself lots of extra capacity. Ensure that you’re insured, use a professional mover, back everything up, and test, test, and test again.